How to Make Brownies in a Hotel Microwave | I Wanna Bake! Last week, Josh and I went to Boston for a conference. 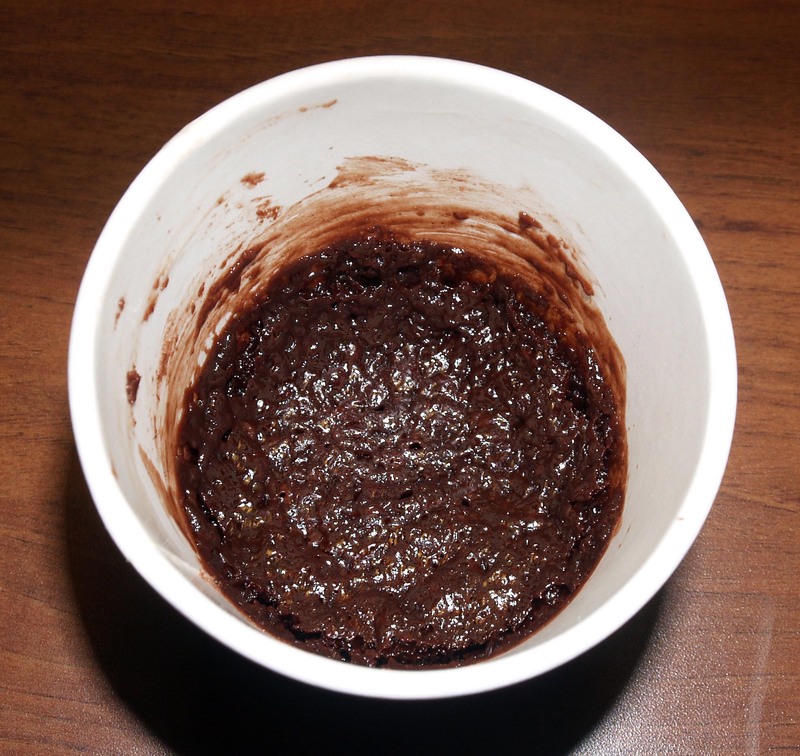 In anticipation of my impending separation from my beloved oven, I came up with a challenge for myself: bake brownies using only things that could be found at or around the hotel. 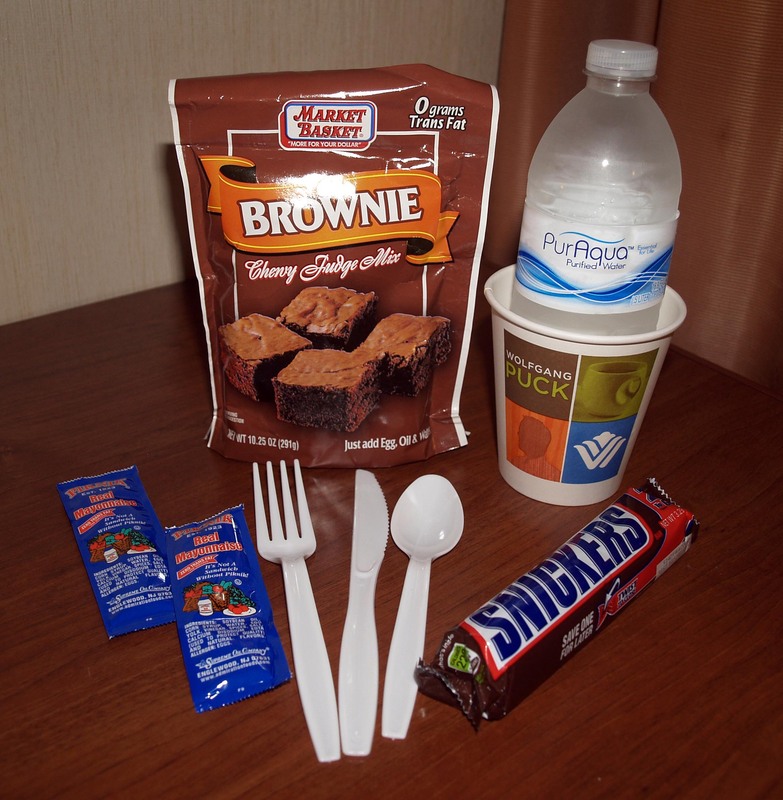 I did buy a bag of brownie mix (after all, there’s usually a good chance that you can find a CVS, grocery store, or convenience store somewhere near your hotel), but everything else I used could feasibly be found in the hotel. 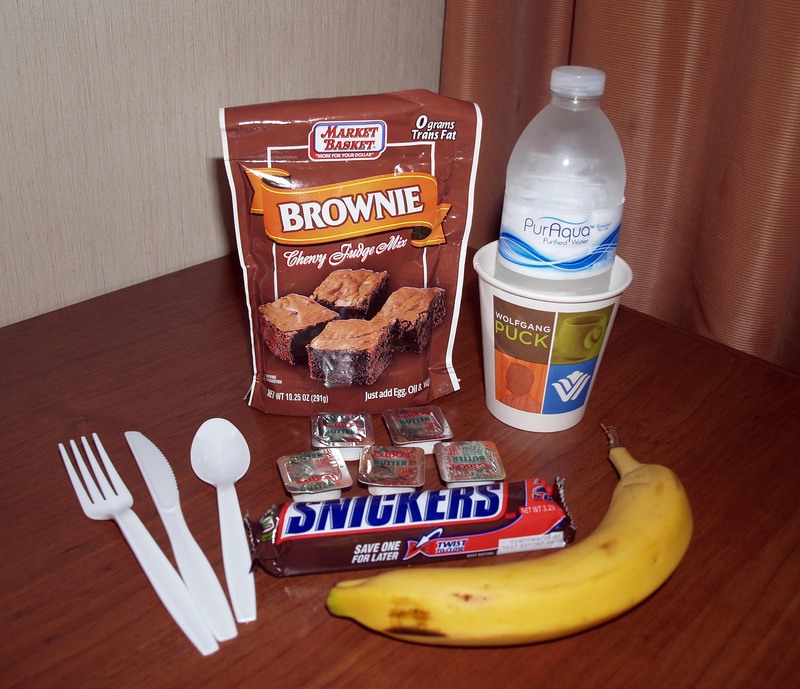 The availability of some items, like the banana, will most likely be determined by whether your hotel offers free breakfast or not, but hey, I managed to make brownies from a kludge of things, so I’m going to choose to suspend some disbelief here. I tried two different versions of this recipe so I could give you some different ideas based on different potential ingredients. One version used banana in place of the egg called for in the brownie mix recipe. I was able to hoard some individual butter packets while out to dinner (grandma would be proud), but the banana theoretically could have replaced both the egg and the oil at the same time. The second version used a single-serve mayonnaise packet I saved from a sandwich in place of the oil and the egg (since that’s all mayonnaise really is). (Dunkin Donuts also had these mayonnaise packets near the sweetener packets, so you don’t have to rely on the possibility of having a packet tucked into your pre-wrapped sandwich to try this.) I know it sounds gross, but you couldn’t taste either oddball ingredient in the final product because chocolate is a pretty overpowering flavor. 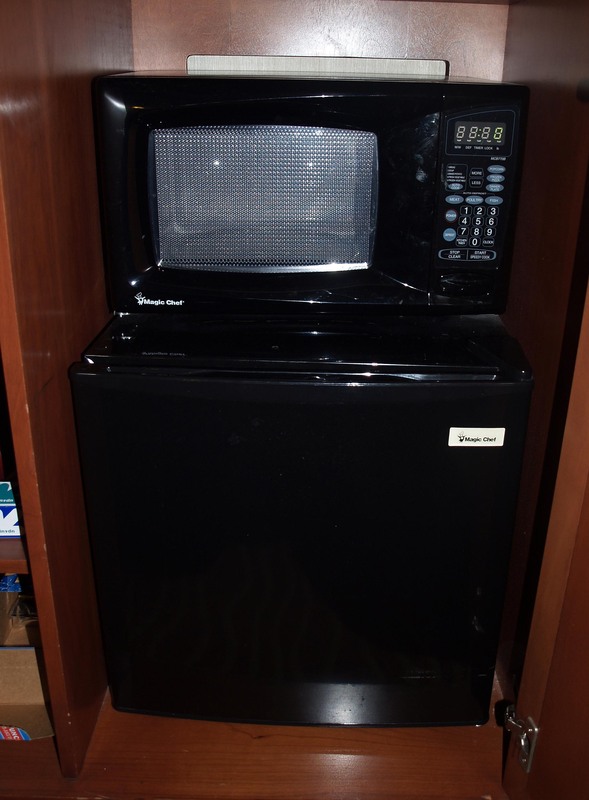 Unfortunately, this probably won’t work for you if your hotel room doesn’t have a microwave. You could try using a hairdryer (anyone who watches Cutthroat Kitchen has probably seen this done before), but I can’t comment on the efficacy of this method. We had a pretty sweet setup this time with a microwave and a mini-fridge, so my life was pretty easy. I didn’t have access to the whole music collection while away, but my Boston-inspired suggestion would be Aerosmith, also occasionally know as “the Bad Boys from Boston.” For this one, I’d suggest going with whatever you can get your hands on given hotels’ questionable internet connections and your own likely-to-be-limited space. 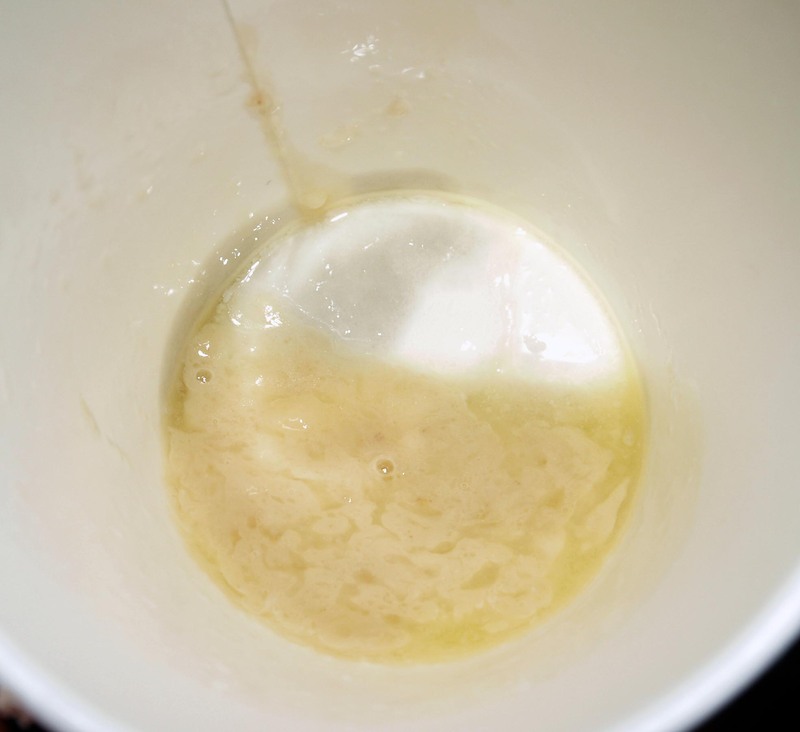 Melt the butter in a paper cup or mug. This took about 20 seconds for me. 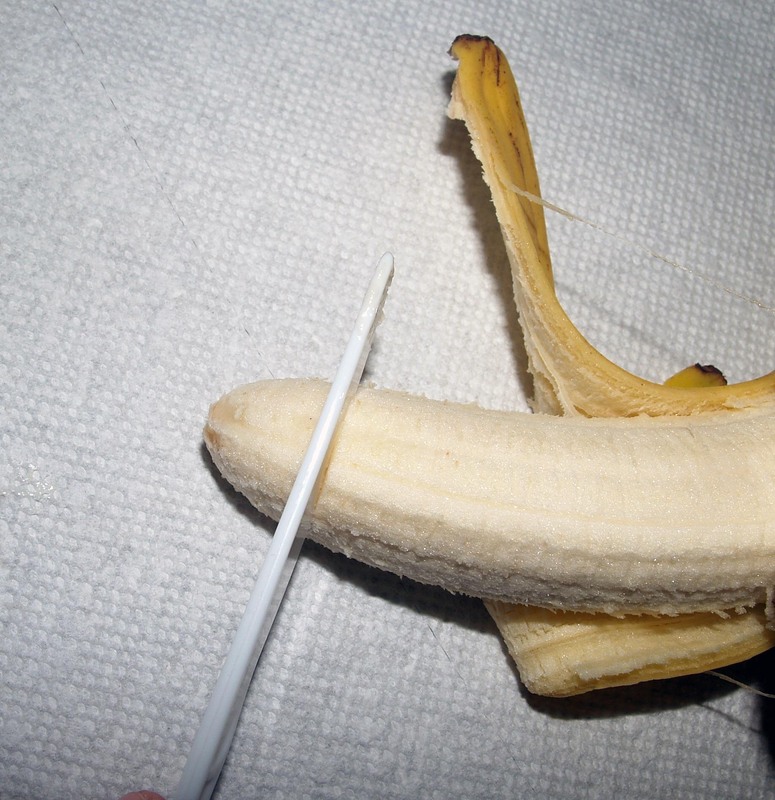 Now cut off about 1/2″ of the banana and mash it in the butter with a fork (this was a little difficult with the plastic fork I had, but it worked eventually) until you don’t see any more large chunks. 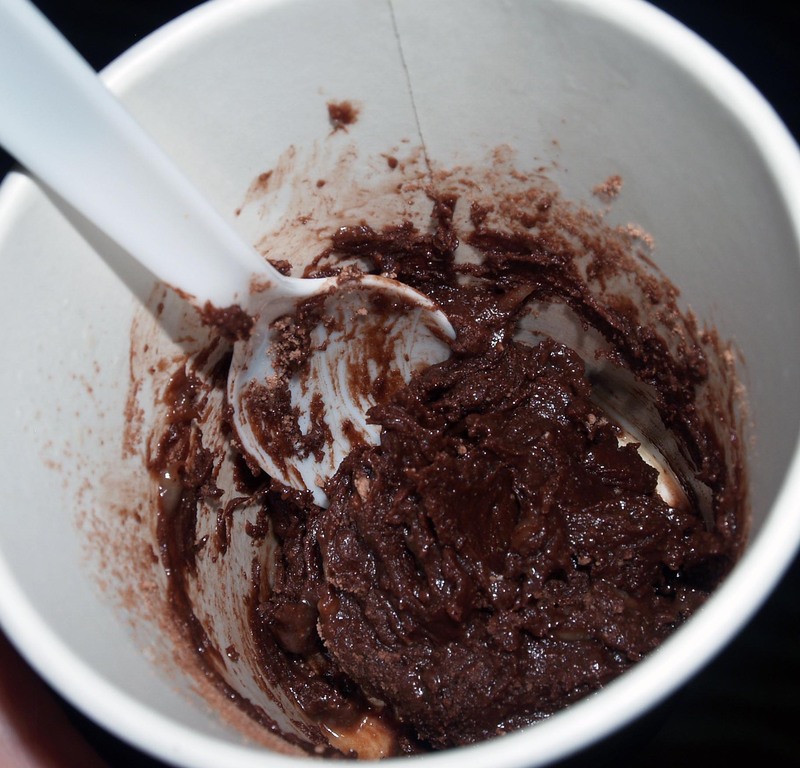 Stir in 1/4 of the packet of brownie mix (I just eyeballed this, it’s not the end of the world if it’s not exact). It should already be looking mostly like brownie batter, albeit a bit thick. Now add a tiny bit of water at a time to thin the batter to the proper consistency. 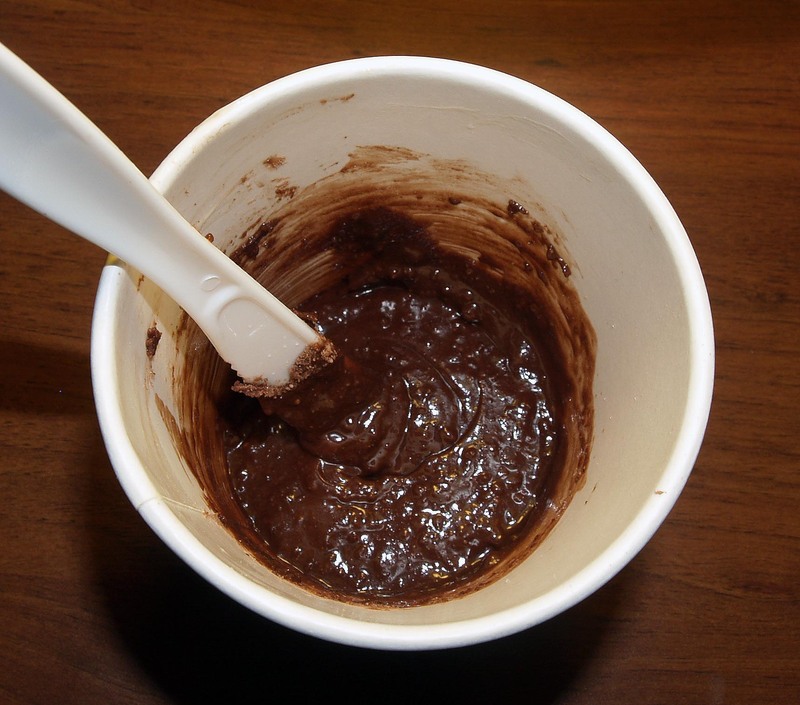 If you add too much water by accident, just add a little more brownie mix to make up for it. Finally, chop up your candy bar and stir as much as desired into the mix. Microwave the mix for 90-150 seconds, checking after 90 seconds for doneness, and then every 30 seconds thereafter. A fork stuck into the center should come out clean and the brownie should be firm to the touch (but be careful, it’s hot). 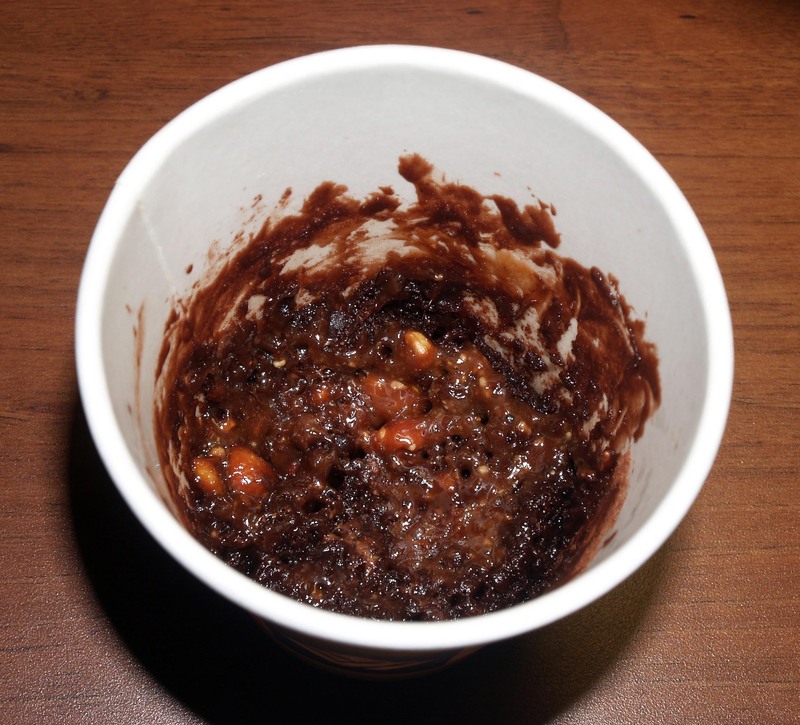 If you use the candy, keep in mind that it’s going to still look liquidy on top because of the melted candy guts. which may rise to the surface. It doesn’t look too pretty but, it actually tastes pretty good. This version is even easier. 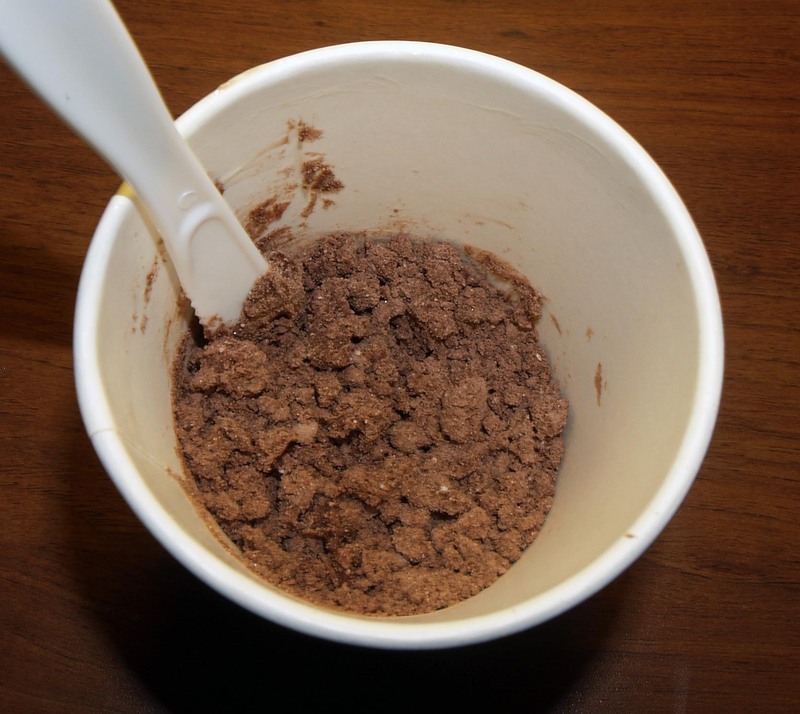 Pour 1/4 of the packet of brownie mix into your paper cup or mug and stir in the mayonnaise packet. The mixture should be crumbly. Add in water a tiny bit at a time until the consistency is right (thick, but stirrable). Add your candy at this point (I didn’t use it for this one). Microwave for 90-150 seconds, checking after 90 seconds and then again every 30 seconds thereafter. 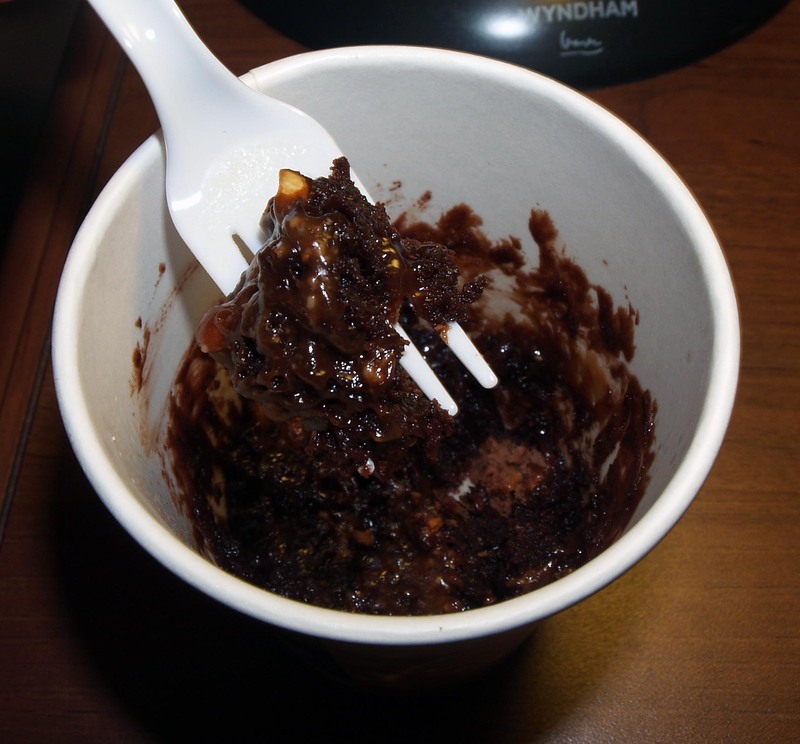 A fork inserted in the center of the brownie should come out clean. Now that I’ve tried it two different ways, I can definitively say that this is the most ridiculous way to make brownies I’ve ever seen. 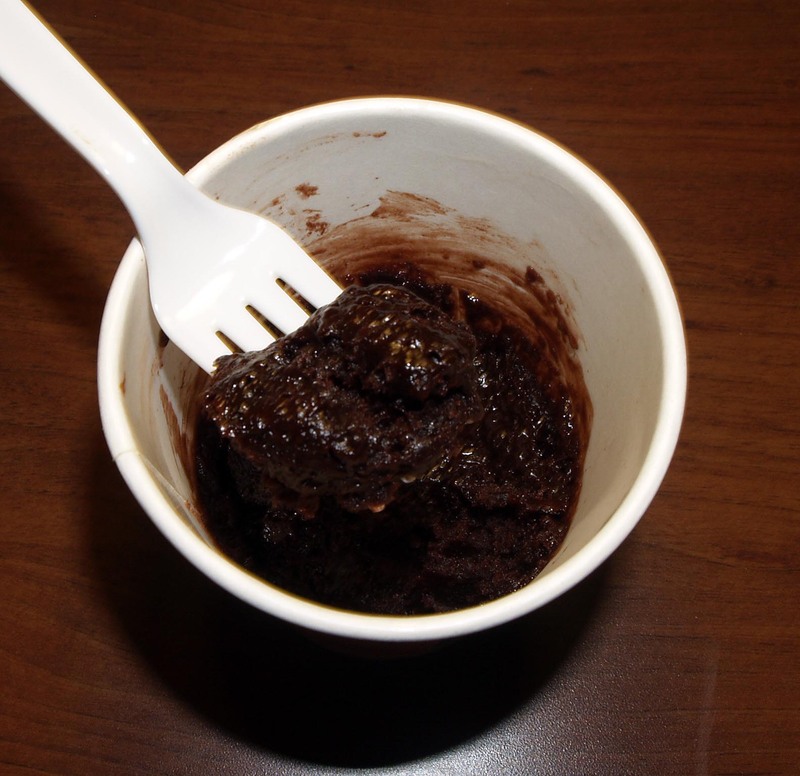 Of course, you could probably just buy a brownie wherever it is you can get a packet of brownie mix, but this is a fun and silly activity that’s sure to kill some time and leave you with a surprisingly tasty, warm brownie. Enjoy my harebrained scheme!